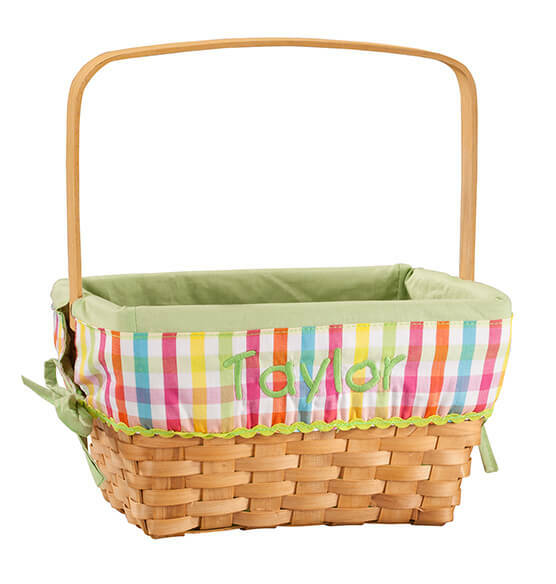 A treasure to love for many Easters to come, this Personalized Plaid Wicker Easter Basket includes a fancy plaid liner, personalized for one lucky child! The classic Easter basket for kids is crafted of durable chip wood and features a 6" high folding handle for easy carrying at egg hunts. 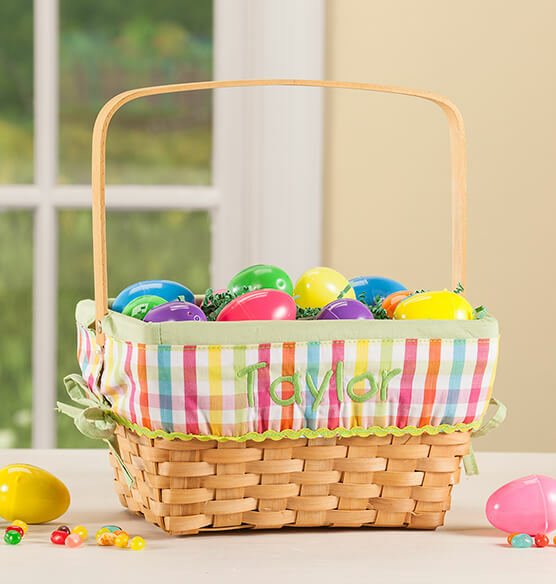 Allowing plenty of room for Easter toys and treats galore, the personalized easter basket opening is 10" long x 8" high, and basket is 6" high. After the Easter goodies are gone, this basket also makes a fun, sturdy holder for crayons, markers, sidewalk chalk, sand toys, building blocks and more. Securing with 2 side ties, the removable fabric liner is soft, solid green inside with colorful plaid outside and fancy ric-rac trim. We'll custom embroider with one special name, creating a one-of-a-kind keepsake. Specify name; limit 1 line, 10 letters/spaces. Liner is polyester; hand wash. Candy and toys not included. What are the dimensions of this basket? The overview is confusing, it says 10 inches long and 8 inches high. BEST ANSWER: Thank you for your question. The basket opening is 10"Lx8"W, and basket is 6"H.We hope this information will be of help to you.